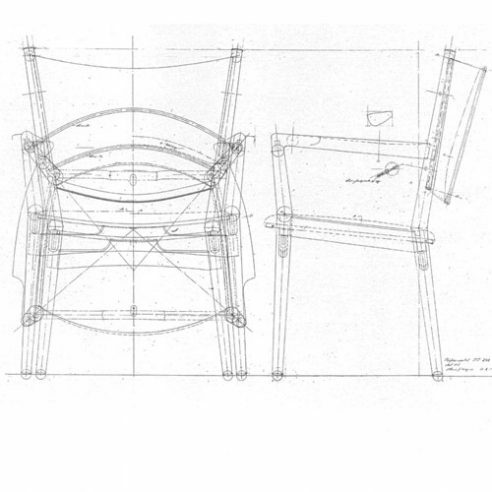 In 1989, at the age of seventy-five, Wegner was still able to design a conference chair that reminded the body of what optimal sitting comfort really is. back and seat in fabric or leather form part of a fixed construction. Located in Allerød, north of Copenhagen, PP Møbler regularly took over Johannes Hansen’s iconic chair designs, but Wegner also designed new chairs for PP. Three of these – PP124, PP114 (the Møller Chair) and PP240 – have a visual kinship, since they all have the distinctive V fan shaped back and beautiful solid armrests that narrow flowing almost unnoticeably into the chair’s front legs, in spite of the almost 90° angle where the horizontal armrest and vertical leg join. PP240 is particularly well suited to conference and restaurant tables, where the seated person is in for a long stay.